Jaffna is the largest town and a historic capital in Sri Lanka’s northern province. 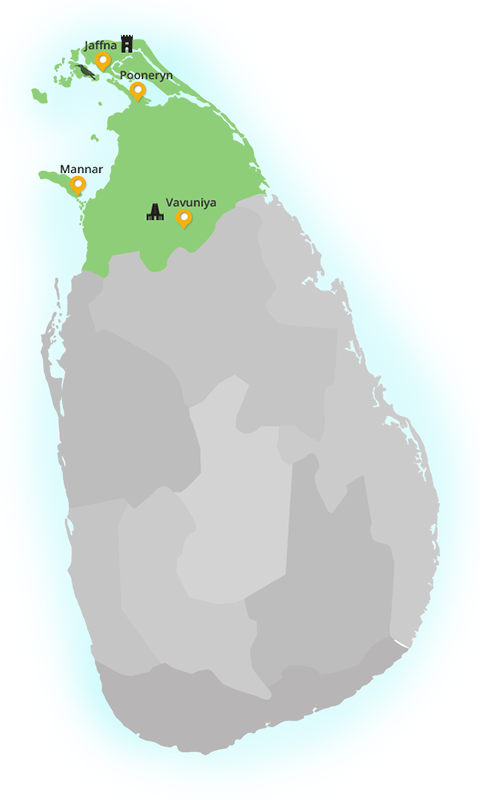 The Jaffna Peninsula was the heart of where the three decade long conflict took place between the LTTE and the Sri Lanka Army, where a large numbers of lives were lost along with severe damages to houses, places of worship and buildings across the region. Since the end to hostilities in 2009, Jaffna has been slowly but steadily recovering with economic ties being re-established with the rest of the country and facilities for tourism including hotels and guest houses opening up. Jaffna and its surrounding areas are steeped in history; there are some extraordinary archaeological sites, numerous colourful and sacred Hindu Temples, a large number of ruined forts and buildings including a number of churches which date back to the time of colonial rule. Despite being a Hindu dominated region, there are a number of ancient Buddhist sites such as Kandarodai, Nagadeepa Vihara and Dambalola Patuwa which are linked to the periods when Buddhism was spread across Sri Lanka over two millennia ago. The iconic Jaffna Fort was once regarded as the finest example of Dutch architecture in the world. Jaffna cuisine has its own distinct flavor and is rich in spices with numerous dishes resembling foods from parts of south India. Jaffna is famous for its fresh sea food and the Jaffna Lagoon Crab is one of the most sort after delicacies. There are white sandy beaches in Delft and Karaivitu and picturesque lagoons and waterways which are abundant in birdlife. Jaffna town is a riot of colour and its markets comprising of local produce, garments and gold jewelry is fascinating to explore.